NEW BRITAIN — At 26, Republican mayoral nominee Erin Stewart says she’s got exactly what city government needs: Vitality and fresh ideas. “I bring a new vision, a fresh vision, a new energy, enthusiasm,” Stewart told the crowd of Republicans who gathered to endorse her campaign Friday night. A group of more than 70 party members and candidates gave a standing ovation when former Mayor Timothy Stewart nominated his daughter. Erin Stewart, a school board member, has her sights on putting Democratic Mayor Tim O’Brien out of a job in November. She got a boost Friday when state Senate Minority Leader John McKinney showed up at the endorsement convention to speak on her behalf. “Erin has a tremendous amount of passion and love for the city of New Britain,” said McKinney, who knows her from her work as a legislative aide at the Capitol. Mary Marrocco, who served on the council during Timothy Stewart’s administration, called on Republicans to support this year’s youth-oriented ticket. 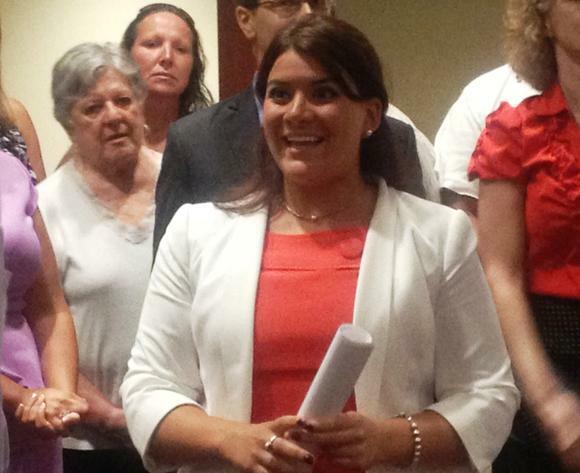 Erin Stewart will head a ticket including common council incumbents Willie Pabon and Jamie Giantonio and challengers for an open seat and 12 others held by Democrats. The Republican lineup for council also includes Chris Duffy, Diane Domejczyk, Hunter Mathena, Al Mayo, Don Naples, Robert Smedley, Iwona Rutkowski, Paul Shaker Jr., Celeste Roche, Chris Polkowski, Carmelo Rodriguez, Danny Salerno and Matt Cannata. Among the other candidates endorsed Friday night was former Alderman Mark Bernacki, who is running for city clerk. Erin Stewart said she’ll need the work and support of the entire ticket, but promised that victory will mean major improvements for the city. “I’m an experienced young professional woman with a yearning to make a difference in my community, with a decade of service to my community, she said.